Ahead of Minnesota’s primaries on Tuesday, Representative Keith Ellison has denied allegations that he had emotionally and physically abused a former girlfriend, including once trying to pull her off a bed while yelling obscenities at her. In an email to The New York Times on Sunday night, Ms. Monahan, an organizer at the Minnesota chapter of the Sierra Club, said that she survived what she described as “narcissist abuse” after a multiyear relationship with Mr. Ellison, the deputy chairman of the Democratic National Committee. Some details in her email about the allegations differed slightly from her son’s account. While Mr. Monahan’s account described a video that he says showed Mr. Ellison pulling her off the bed, Ms. Monahan described an episode in 2016 in which he “kept trying to drag me off the bed.” She did not mention a video. Mr. Monahan wrote on Facebook that his mother experienced “pure hell” during the relationship with Mr. Ellison, 55. He wrote that he had uncovered, on his mother’s computer in 2017, more than 100 messages between them that showed she had been bullied and threatened. On Monday, a spokesman for Mr. Ellison’s campaign referred to Sunday’s statement. Mr. Ellison, who lost a 2017 bid to become the party’s chairman, announced in June that he was stepping down after 11 years in Congress to run for attorney general. A representative for the Democratic National Committee did not respond to a request for comment. It was still unclear on Monday whether there would be immediate political consequences for Mr. Ellison, who has been endorsed by Senator Bernie Sanders. His opponents in Tuesday’s primary had not called on him to drop out, but two of them called for an immediate response. Another said if a video exists, it should be given to the police. A women’s advocacy group called for him to withdraw the race. In the email she sent on Sunday to The Times, Ms. Monahan said it had been “a very difficult time for me and my family” and she “was not in a place to talk.” The Monahans did not respond Monday to messages for further comment or an opportunity to review the messages and video. Minnesota Public Radio said it reviewed more than 100 messages between Mr. Ellison and Ms. Monahan, which it said had been provided to the news organization by Ms. Monahan. “There is no evidence in the messages reviewed by MPR News of the alleged physical abuse,” the news organization reported. Mr. Monahan told the Star Tribune that he did not have a copy of the video, but stood by what he said he saw. Ms. Monahan said in her email that she started to suffer from post-traumatic stress disorder around 2014, and was in poor health when the relationship ended, a point for which they gave different dates. Mr. Ellison separated from his wife, Kim Ellison, in 2010 and the couple divorced in 2012 after a marriage of more than two decades. On Twitter, an account under Ms. Monahan’s name wrote favorably about Mr. Ellison for years. One message in July 2016 to Mr. Ellison thanked him for visiting the state’s Sierra Club chapter. Jonathan Martin contributed reporting, and Doris Burke contributed research. Collagen Peptides are known as one of the best sports nutrition post workout and recovery products. After you workout, your body is in desperate need of recovery. Collagen makes up so many building blocks of what your body needs to recover, it is the perfect supplement for immediately after a workout. In today’s article, we are comparing Sports Research – Premium Collagen Peptides Vs. Physician’s CHOICE Hydrolyzed Collagen Peptides. These are the two best collagen supplements for women in the world, having innovated a specific formula that helps athletes recover faster. Physician’s Choice Grass Fed, Pasture Raised, Non-GMO, 100% Hydrolyzed Collagen Peptides Powder has been specially formulated with digestive enzymes for enhanced absorption and concentrated delivery of the beneficial amino acids collagen is known for. Their collagen is not generic collagen that gets thrown in a tub and put up on a shelf without thinking. Rather, they have worked with real medical doctors and formulators to develop a superior collagen product. Interestingly, Physician’s Choice team has examined the bioavailability of collagen with research and studies behind what makes collagen effective. They ran many tests, performed their own research, and found that nobody else was addressing the absorption issue associated with collagen supplements. Collagen suffers from a big absorption problem. When taken without a bioavailability agent (like most collagen products on the market), it actually isn’t effectively absorbed into the bloodstream or intestinal walls. This leaves large portions of the collagen sitting in your gut or excreted from the body. They have formulated a 100% pure, twice-hydrolyzed collagen peptide supplement with a naturally occurring bioavailability agent to improve absorption. By adding targeted digestive enzymes to break down the peptide chains, they ensure nearly all of the active tripeptides, dipeptides, and free amino acids are quickly released and absorbed. Without the science: They have created a double hydrolyzed collagen peptides powder with digestive enzymes for enhanced absorption. The digestive enzymes and double hydrolysis they use quickly break down collagen peptides into beneficial amino acids. Thus, you get the true benefits of collagen without having to buy pounds of ineffective powder. The double hydrolysis of this collagen not only enhances absorption into your bloodstream but also easily mixes more easily with liquids. Their collagen is double hydrolized, using an enzymatic process which completely breaks down the peptide chain. This double hydrolysis wasn’t enough for them. They wanted more absorption from this collagen, so they took it a step further and introduced a proven bioavailability agent. Collagen increases concentrations of beneficial amino acids that are effectively absorbed into the intestinal wall and bloodstream. These amino acids are what provide the many benefits collagen is known for. Collagen Peptides Powder contains hydrolyzed type 1 & 3 collagen sourced from grass-fed cows. Collagen is one of the most important nutrients needed to ensure the health and vitality of your skin, hair, tendons, cartilage, bones, and joints. Now that I’ve made digital marketing agencies sound like teams of superheroes, you’re probably wondering what it is that they typically do. Let’s review the top three areas digital agencies focus on. A great digital marketing agency has the means take over your marketing from top to bottom. For starters, their business expertise allows them to evaluate your brand’s needs and develop a powerful strategy that maximizes profits. They’ll work with your company to improve efficiency and productivity. With their help you’ll better define your objectives and set measurable goals. Moreover, the focus on data and targeting requires a clear definition of your target buyer, which is typically more specific than companies currently have in place. When working with a digital marketing agency you’ll determine exactly who your ideal buyer is and analyze their buying journey. Like I said, digital marketing is highly targeted. When you know your target well, you’ll determine what your messaging and benefits should be to speak directly with your ideal buyer. Your unique selling proposition as it aligns to your ideal buyer is what forms a connection with the people who buy from your company. As digital marketing revolves around your online presence, a digital marketing agency will work extensively on developing your online hub. This can, and usually does, take many forms. A highly effective, buyer-focused website allows you to showcase your brand online. From there a digital marketing agency will help you determine which platforms and channels should be used to reach your ideal buyers. A skilled digital marketing agency will position your company as a market leader by creating content that allows you to establish your brand authority and expertise online. As true experts, an agency team will execute the most modern and effective content strategies in order to provide the best possible organic search rankings. They will create and implement expert social media marketing strategies that deliver a marketing ROI beyond anything traditional marketing could ever hope to deliver. Social media, when done well, will be focused on the context of the channel and yet fit into the overall marketing strategy. No matter how or where you’re currently marketing your business, one thing is for sure: A skilled digital marketing agency will take your marketing, brand awareness, ROI, and overall profitability to new levels. 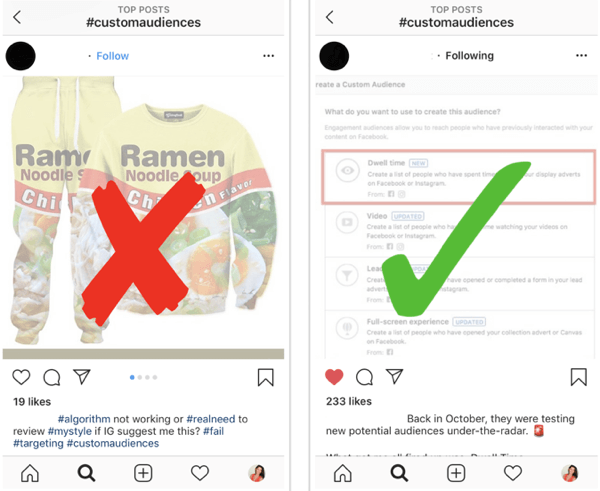 In this article, you’ll discover how to combine an Instagram growth strategy with an ad sequence that can turn followers into customers. On average, Instagram users share “more than 95 million photos and videos every single day,” according to Reuters. That amounts to a lot of noise for Instagram marketers to break through to get their message in front of potential customers. Start by searching 10 relevant hashtags. Locate the top 9 posts for each hashtag. Leave a meaningful comment (your two cents [$0.02]). The $1.80 Instagram growth strategy boils down to this equation: 10 hashtags multiplied by 9 posts where you leave your $0.02 = $1.80 in community-building effort. Getting 2x, 5x, or 10x growth results with this strategy doesn’t happen overnight. It requires you to stay consistent and make community-building a regular action for your brand. As Gary states, “The number of Instagram followers you have means nothing if you can’t build a community of like-minded people who care and engage.” It’s those people who then go on to become customers, brand evangelists, and significantly drive your brand goals forward. Finding this pocket of people is as simple as becoming part of the conversation. In 2018, we used this strategy at The Ad Strategist to double the size of our Instagram following. More importantly, by implementing the $1.80 Instagram growth strategy, our Instagram engagement custom audience grew to almost 3x larger than our follower count. Why is this important? The size of your warm custom audiences represents the number of users who’ve had a meaningful interaction with your brand. This includes everyone who liked, commented on, sent, and saved your content; DM’ed you; or clicked the link in your bio. Of course, just because someone interacts with you doesn’t mean they follow you on Instagram. And if they’re not following you, it’s unlikely they’ll see your organic content and posts in the future. That doesn’t mean those users are gone forever, though. You can create a dynamic Instagram ad sequence targeting your Instagram engagement custom audience that converts those non-followers into followers and then customers. Running ads to this engagement custom audience resulted in 50%–100% cheaper lead costs in an ad spend study of over $45,000 with 349 ad set variations. So targeting this Instagram engagement custom audience creates costs per result that are significantly lower than if you were to target cold traffic. 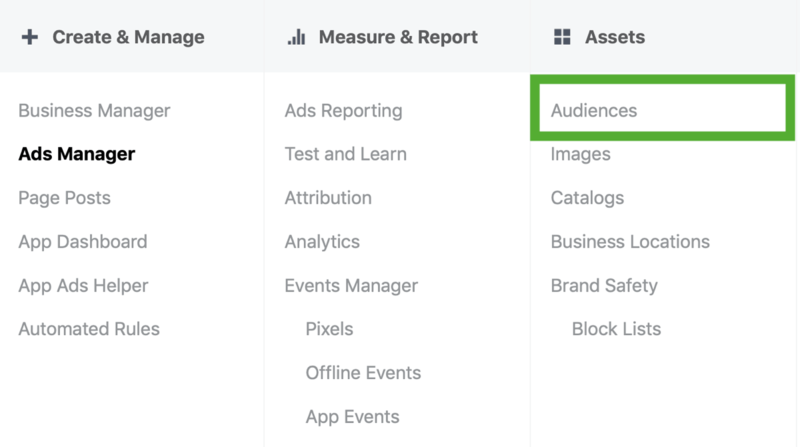 To create an Instagram engagement custom audience, navigate to the Audience dashboard in Ads Manager. 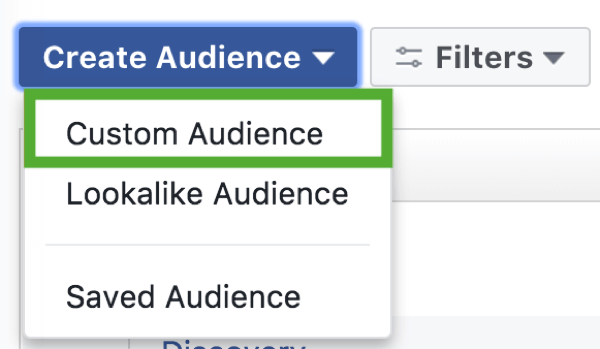 Then click Create Audience and select Custom Audience. 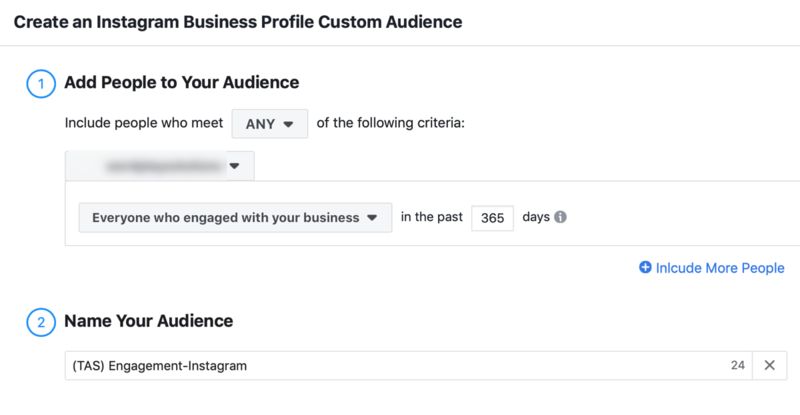 In the Create a Custom Audience window, choose Instagram Business Profile. 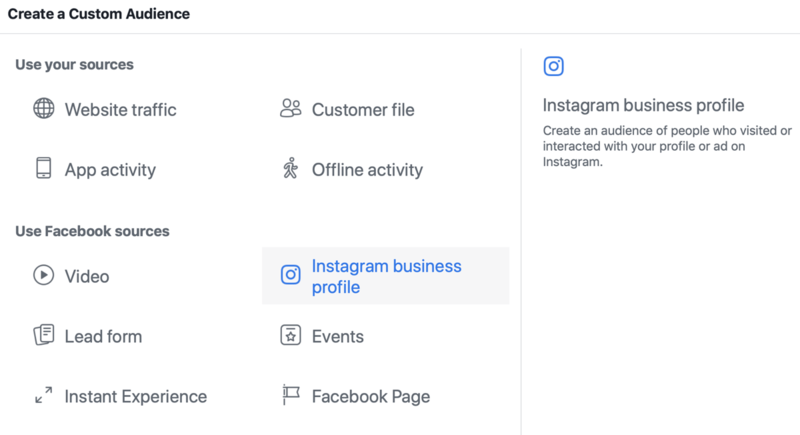 Next, select the correct Instagram profile and ensure Everyone Who Engaged With Your Business in the Past 365 Days is selected. Choose a name for this audience that will be easily identifiable to you in the future and then click Create Audience. Remember that it takes up to 24 hours to reveal the size of your current Instagram engagement audience. Now write down the current size of this audience to determine your starting point. I recommend that you track the growth of this custom audience weekly as you implement the rest of the $1.80 strategy consistently to assess your measurable growth. For fellow spreadsheet connoisseurs: Tracking this data in a notebook can feel like poking your eyes out, so here’s how to structure your results tracking spreadsheet. Set up your spreadsheet to track the total Instagram engagement custom audience with a separate column for each week. Then use the formula =sum(D5-C5)/C5 to calculate your weekly growth rate. Now expand the weekly growth rate calculation across all weeks. The result is the growth rate of your retargetable custom audiences using the $1.80 Instagram growth strategy over time. Once you have this information for a larger range of weeks, you can assess what is and isn’t working for you and then tailor the rest of your Instagram marketing strategy accordingly. Now that you’re tracking your retargetable engagement, the next step is to find relevant hashtags for your business. 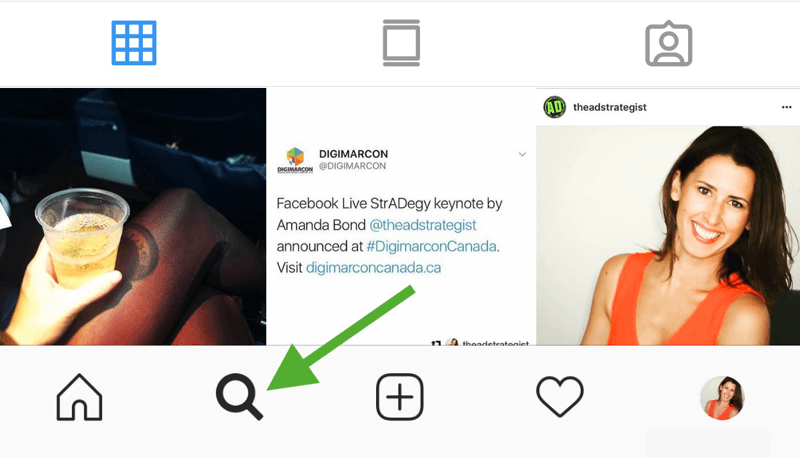 Open Instagram and navigate to the Search & Explore tab. Start by searching for one hashtag such as #facebookads. You likely have a core group of hashtags you’re already using in your own posts. Because it’s best to search and engage daily, I recommend that you set up a spreadsheet to track all of the relevant hashtags you’re using because the list will quickly grow. This leads me to the conclusion that we won’t use #facebookads in our own Instagram efforts going forward. As you research hashtags and carry out your daily $1.80 growth strategy, make note of the highest-quality hashtags you find. Then use those in your organic content’s written captions to give yourself the greatest opportunity to get in the Search & Explore tab of your ideal customers. 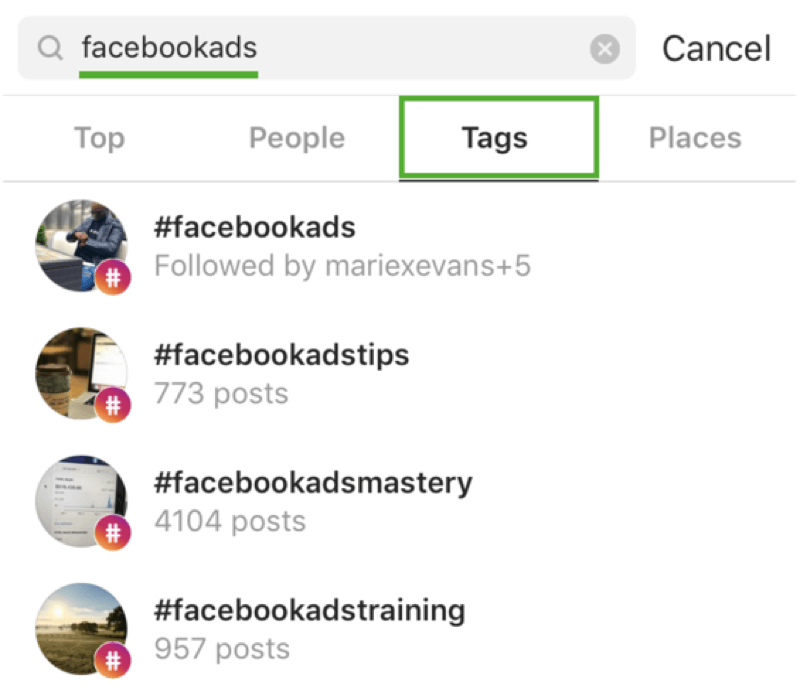 After you’ve found your Instagram hashtags, it’s time to filter through the content you’ve found to determine whether it’s relevant and valuable for you to leave your $0.02. Not every post is created equally—especially in a world full of spam bots and automation. Quickly measure the engagement rate (likes and comments vs. total followers). Click the account profile image to check out their bio and the rest of their profile. Remember, this strategy works across any vertical: B2B, B2C, SMB, etc. It’s the process of culling through the noise to find the gems that most of your competitors aren’t setting aside enough time to do. Here’s what to look for when analyzing accounts. How Much Effort Is Being Put Into Writing an Informative Caption? A lot of low-quality accounts tend to ‘phone in’ the caption description and jam as many hashtags into the caption as humanly possible—in the hopes that it will help them rank on the Search & Explore tab. Well-written captions crafted with meaningful thought aren’t an easy feat. The Instagram users who are putting in the time and effort to write their own story-driven captions tend to be active community members outside of their own profiles as well. They’re invested in their own Instagram success and your $0.02 interaction helps them signal to the algorithm that their content is also relevant. What Is the Engagement Rate? In my algorithmic experience, engagement is king. If an account has 200,000 followers but barely hits 500 likes and comments on a post (0.2% engagement), what does that say about the quality of their community? On the flipside, never discount an account for having a low follower count. If they have 200 followers and still have 30 likes and comments per post (a 15% engagement rate! ), it shows they’re building a small but mighty community. Engage away! Is This Profile Something You Would Naturally Engage With? Yes, you’ll be deploying this strategy for your social media growth efforts. However, it’s important to make sure the comments you’re leaving have the potential to create strategic and long-term value for your brand and for your potential future community. Otherwise, as with anything, you’ll be wasting your time and getting lost in the weeds. Most people want to skip this step (and the time it takes to properly assess the quality of the Instagram account where you’re leaving your $0.02) and go straight to the end result—revenue growth. Taking your time to build relationships with the right profiles and people can help expedite your growth. The post engagement is lower than the one on the right (total number of likes aside). The caption is stuffed with hashtags in an attempt to rank content vs. writing quality content to engage your audience. The account has no bio or any other qualifying details. The content is relevant and educational. The caption is well-written and informative. The bio clearly states what they do and allows you to identify whether they belong in your community. Now onto the fun stuff! This one’s simple: Be social on social media. At this point in your efforts, all that’s left is to leave your $0.02 on these newfound pieces of content. Let’s talk about leaving your $0.02 for a moment. There’s a difference between crafting a meaningful comment that shows you want to be a part of the larger conversation vs. leaving a comment of three emoji hearts and then bouncing. If all you do is leave emojis, don’t use the $1.80 strategy. Spend your time elsewhere on actions/tasks that move the needle in your marketing. Share your own experiences. Is there something in your life (or behind the scenes in your business) that’s relatable to the original caption? Share that! Ask open-ended questions. The goal here is to get people to come back to your Instagram profile and engage. If you only talk about yourself and your own experiences, it lessens your chance of developing a meaningful conversation with the other person. Don’t be a know-it-all. Let other people share their perspective and worldview. We, as humans, love to share about ourselves often. Remember that this exercise is not about YOU. It’s about the incredible humans you serve in your marketing. The first of these two assets, a captive community, will fuel your organic Instagram efforts again and again. Next time you publish a post, these followers will be hungry for your new content. Because you’ve now engaged in conversations with these users, they’re more ready to engage and respond than total strangers. The second asset is an engaged custom audience that’s retargetable by building a $5/day Instagram ad campaign. When you pair a $5/day Instagram ad sequence with the $1.80 Instagram growth strategy, every image you post, DM you send, and heart you tap is automatically and effortlessly leading people toward becoming your customers. Having a low-cost Instagram ad sequence that’s always running in the background is a simple way to turn followers into fanatical (read: paying!) customers. Set aside time each day to execute this strategy. For me, it’s only 15 minutes a day when I’m in an Uber or waiting for a meeting to begin. For you, it might be a consistent hour from 3–4 PM daily. Your Instagram growth won’t happen unless you put in the time and effort daily, track your results, tweak what isn’t working, and continuously and relentlessly improve upon your efforts. A year from now, imagine your account at 2x, 10x, 100x growth and what that could mean for your business goals. With a simple $1.80 Instagram growth strategy paired with a $5/day Facebook advertising strategy, you can rapidly grow your Instagram account with followers who turn into customers. What do you think? Have you tried the $1.80 Instagram growth strategy? What were your results? Share your results and questions in the comments below. An AR 80 Lower is an incomplete receiver. This means that crucial work still needs to be done on it, but the parts can be sold for personal use to individuals without the hassle of purchasing a normal rifle. By ATF standards, it cannot be considered a functioning rifle if the main fire control group pocket is not manufactured already onto the receiver. This also leads to buyers need the proper tools and knowledge on how to properly assemble the AR 80 Lower. Why do people choose AR 80 Lowers rather than AR completes? Purchasing an AR 80 Lower can be like beginning a new art project. Since the rifle kit does not come assembled, individuals must build it themselves. This is not only a learning experience, but a personal one as well. Given that many other customization options are available to an AR 80 Lower receiver, this makes the buyer ultimately the manufacturer. And as the manufacturer, any serial number combination, any color, any finishes can be made possible. However, buying an AR 80 Lower does not offer much in terms of monetary saving. Usually they can be as much as or more expensive than completes. So really the only reasons to choose the lower would be the value of craftsmanship or a valid reason depending on state regulations. In California, purchasing any AR receiver is treated as a rifle which then prevents buyers from being able to create an AR pistol due to the law that prohibits rifle receivers being made into pistol receivers. However, the ability to create an AR 80 Lower pistol is possible with the AR 80 Lower Receiver. Even though the price is the same, the AR 80 Lower is chosen not because of its cost, but because of dedicated buyers who want to increase their collections and take part in creating something unique. Heck yeah, it was a good deal for a first-time AR guy. Before we get started: for those of you looking for high-quality AR15 kits and 80% lowers at great prices, make sure to visit Thunder Tactical today and check out their amazing range of parts, kits, and accessories. Before long, my research turned up a local dealer who had stripped lower receivers for $48 each. I had a spare flip-up rear sight I loaned him until he could find a suitable replacement. All added up, my buddy had a brand-new M4 for a shade over $350.00, with added sales tax. Factor in the $50 for a flip-up rear sight, and he’ll have a perfectly serviceable AR-15 for roughly $400. Now, said buddy falls firmly into the “just wanted an AR to have one” category. Granted, he may shoot some coyotes with it, but mostly, this particular rifle will probably mostly be a range toy; something to dig out and show buddies, maybe blow off rounds at the sandpit. For these reasons, I felt 100% comfortable green-lighting the project for him; it was perfect for what he wanted to do. The suppliers are also often maligned by AR snobs looking down their noses. But these budget offerings are perfect for what my buddy will realistically end up doing with his AR. My question was: how would an AR-15, pieced together at absolutely-rock-bottom-AR-market-glut prices stand up in the accuracy, reliability, and usefulness departments? “Peak AR” is a play on words referring to the concept of Peak Oil, in which the oil production capacity of the global community reaches its maximum production capacity, at which time demand and consequent production drop (or almost stop) due to maximum supply and minimal demand. It applies well to the AR gun community. As of right now, we have got to be close to Peak AR. After the tragic 2012 Newtown school shooting, many feared high-capacity firearms were soon to be outlawed. The gun world, needless to say, started snapping up anything AR related. I remember being in the middle of an AR-15 build at that time, and suddenly all the parts I’d planned and budgeted for simply vanished, or had prices gouged out of proportion. Everyone wanted some, and manufacturers who would never have considered building an AR jumped on board the train and started cranking out AR-platform rifles to meet the onrush of demand and cash in on the phenomenon. It didn’t help when it looked like Hillary Clinton would become president in 2016. Again, everyone feared outright gun bans, so people who already had one or two ARs bought some more, possibly to bury or plan to sell at a profit later. AR output was cranked up even more. Fast forward to mid-2018. Trump is in office, there is no severe danger of another firearms ban in the next year. Nobody is really buying ARs, since everyone who could already has two or three. Demand has crashed. Anyone who makes AR-15s is trying to get rid of overstock. Prices have fallen on almost everything AR-related. It’s a magical time, and we’re at or close to Peak AR. Even after a couple of “scares”, there will probably be no better time to build an AR platform rifle than right now, if you’ve ever wanted to. As Cheap As It Gets? When the rifle kit arrived on his door, my buddy wasted no time getting the lower and hoofing the parts to my door for assembly. We brought the kit down to my man-cave, put on some tunes, and I proceeded to school him on the ways of the AR lower assembly. And really, building AR-15 lowers is extremely easy if you have the right tools and pay attention to detail. These lower parts kits are a great way for the beginner to get started in the AR-15 build world for not much money. They can also use the rifle as a baseline to figure out what improvements to make. But will a less expensive gun fail before a more expensive gun? Aye, there’s the rub. It’s nothing you can answer definitively “yes” or “no” based on a sum of a gun’s parts. You have to remember that (let’s be honest here) almost nobody running one of these guns in any scenario will: A) have it on a full-auto lower with a giant pile of pre-loaded mags kicking around, and B) run through those magazines as fast as you can on rock ‘n’ roll, using it like a belt-fed squad-level machine gun. The vast majority of people purchasing a kit may perform crowd-pleasing semi-auto mag dumps or even play with a bumpfire stock at a sandpit – but on a whole, these guns will usually be serving up semi-rapid, occasionally aimed fire then (hopefully) cleaned and maintained. Under these conditions, a PSA AR-15 will last much, much longer than just 440 rounds – you should easily see many thousands of rounds through a carbine before you need to start replacing or upgrading stuff. Even hypothetically using an AR-15 to defend a hypothetical bug-out location in a hypothetical post-apocalyptic event where one may indeed have a bunch of hypothetical mags ready to go for defending against a hypothetical threat: if you shoot so rapidly and so often that your gun cooks itself to death, you better have a priest behind you handing you a spare rifle along with your last rites, because something definitely went wrong with the plan somewhere. Even Rick Grimes didn’t rip through 440 rounds attacking a Saviors outpost, so you’re probably theoretically in good shape regarding your inexpensive AR’s round count lifespan. Non-mechanical disaster struck when my buddy brought his new AR to the range. Being along in years far enough that his eyes have decided to stage focus mutinies, my buddy found that his shiny new AR’s iron sights were just a big blurry mess. He ran a few rounds through it, then went home after ensuring it functioned. We started chatting about solutions the next day. He obviously needed an optic. Fortunately, he had a spare 3x-9x hunting scope kicking around, so he wanted to install that on the rifle. He was starting to consider hunting with the rifle, so he was pretty enthusiastic about the scope idea. We looked at mounting options – he was on a very tight budget – and finally decided on the Nikon P-series two-piece scope rings. He was looking at one-piece bases, but we discerned that the two-piece ring system would offer us more flexibility in mounting this and any other scopes he might want to run in the future. He ordered up the rings next paycheck, and I mounted it all up for him one evening after work. Easy upgrade, made easier by the M4’s flattop railed upper receiver. Everything was going well until he found a kid selling an AR-oriented el cheapo Chinese fixed 4x scope with an illuminated reticle for $40. The tacti-cool 4x went on as quickly as the previous model could come off, and my buddy admitted he thought it looked cooler…and the glowing reticle helped his failing eyes. The next time, he was able to slap the trigger and group green-tip ammo into about 4” at 50 yards. He was pretty happy, knowing he wasn’t a great shot and that it was essentially military surplus ammo. I told him the 1/7 rate of twist barrel might not be doing him any favors with the light bullets, either – but the gun performed exactly as he expected at his skill level. Since I put the rifle together with him, he has had a neighbor of his (who had a surplus of cast-off, no longer used AR-15 parts) upgrade the upper for free to a stainless 1/8 twist chambered barrel with a free-floating rail. He loves it, since it “looks all badass” and it still shoots, well, 4” groups at 50 yards with him behind the trigger. Guess sometimes it ain’t the arrow, it’s the Indian. I was able to get behind the wheel and get groups of about 4” at 100 yards from the bench, gritty trigger and all. Not great for a tuned high-dollar AR-15, but not bad for 350 bucks. However, after several hundred rounds through the gun, my friend with his current rifle setup has happily reported zero malfunctions with the gun. The inexpensive package has performed well for its cost level, demonstrating itself as a notable starter point for upgrades down the road. But is sourcing pre-made entry-level AR-15 parts kits worth it? Do they perform to a level reasonably high enough to justify not going out and sourcing high-dollar alternatives? Well…that’s the real question, isn’t it? From what I’ve seen, I’m going to take a deep breath, clamp my eyes shut, and say…yes. Throw rocks, but for someone just starting out in the AR-15 world, inexpensive kits are a great place to start. And, to do it without going into serious debt. Our subject rifle met all the goals set before it, at a reasonable price. It also continues to perform to its owner’s satisfaction. Staying inside this envelope, kits and those of its ilk are really a pretty good way to go if you’re not expecting a match gun or long-term survival gun. So if you’re just starting out or can only afford to part ways with $400 or less, shrug off what the snobby high-end AR guys will tell you and try a cheaper kit from a reliable supplier. Look for reviews, ask around, and find what works for you. It’s a great way to learn the workings of an AR-15 platform, and they can be upgraded easily. There is no more popular vacation destination on earth than Walt Disney World, Florida. Since 1971, the Magic Kingdom has been the foremost tourist attraction, both in America and the world, and with its rides, attractions, characters and events, it’s easy to see why. But even with all of this popularity, there are things a lot of people don’t know about the park. Secret events, tricks and backdoors into the park to make your experience all the better. Join us today, as we bring you four Disney World tips to help you make the best of your upcoming vacation. Discover three pro Disney World tips ahead of your next big vacation. The Magic Kingdom rewards its citizens for their promptness in one extremely fun way: the early morning Train Station Welcome Show. Introduced in 2017, the park’s daily welcoming ceremony is a great way to set the mood for the fun and magic of the day ahead. Arrive fifteen minutes ahead of the park’s opening for a cavalcade of all the park’s most treasured characters, welcoming you for the day. There’s singing, dancing, and a beautiful fireworks display. It’s the perfect way to put an official seal on your day, kicking off the magic and getting you in tune with the Disney spirit. Believe us, when you do Disney World, it pays to do it right. Park goers who can’t make the early morning welcome can opt to stay thirty minutes after the park’s closing for the magical Kiss Goodnight. Taking place at the Cinderella Castle, this is an enchanting, thirty minute light display that is a joy to watch. Delight in the changing, choreographed light display, set to When You Wish Upon a Star. This is another one of those must-see attractions that really completes the entire Disney World experience. Remember: this is the Magic Kingdom, and any excuse for more magic is a bonus! Disney’s PhotoPass cast members take snapshots with paying park visitors to help them capture the memories. That being said, however, they will also gladly take photos for free with your camera or phone, if you approach them. This is “the happiest place on earth”, after all, so it makes sense. Disney World is a great excuse to take some gorgeous vacation snapshots. And the most popular by far is usually taken in front of Cinderella Castle. But keep in mind that there are many areas of the park that are equally whimsical to take photos at, including the back of Cinderella Castle. Remember to case the campus for good photo opportunities ahead of time and, when faced with the dilemma of waiting twenty minutes for a photo or going exploring, just explore. And there you have it: four closely guarded Disney World tips to make your next vacation to the Magic Kingdom even more special. For some of the best holiday deals to Disney and other top holiday destinations, visit Rooms101 today and get ready for some serious fun. Las casas vacacionales en Orlando son propiedades que les brindan a los huéspedes mayor libertad, independencia y un ambiente más cálido que el que se puede percibir en un hotel. Orlando es una gran ciudad, centro turístico de muchas familias en los Estados Unidos y en el mundo entero ya que dispone de gran variedad de parques temáticos de diversas franquicias, siendo la más famosa el parque temático de la mundialmente famosa franquicia Walt Disney. Orlando, FL, es un destino vacacional al que suelen ir grupos familiares, desde núcleos familiares de 4 a 6 personas, hasta incluso 10, acudiendo padres, hijos, abuelos, etc.… con la mira de disfrutar de sus asombrosos parques temáticos juntos, en especial el parque temático de Disney World, por lo que el tema del alojamiento cobra vital importancia, sobre todo, si este se encuentra cerca dicho parque. Al viajar las familias toman una serie de decisiones importantes, y en los últimos años, las casas vacacionales de Orlando han tomado mucho auge ya que estas brindan mayor comodidad y privacidad, además permiten a quienes las alquilan poder sentirse como en casa, lo que ayuda a reponer las energías y prepararse para el próximo día, un día lleno de acción y diversión en los parques temáticos de Orlando, FL. Muchas casas vacacionales en Orlando suelen quedar algo alejadas de los parques temáticos, sin embargo, existen algunas que se encuentran ubicadas estratégicamente a minutos del parque temático de Disney World, el más visitado de todos los de Orlando, FL, de forma que aquellos que logren alquilar o comprar una casa en Orlando, definitivamente debe ser una cerca de Disney. Casas vacacionales en Orlando, FL… ¿Rentable? Este tipo de instalaciones para hospedarse durante un viaje a Orlando suelen ser muy cotizadas, en especial si se tratan de viajes de más de una semana ya que así funciona el alquiler de este tipo de propiedades, las mismas realizan alquileres semanales y no diarios como podría hacerse al hospedarse en un hotel, por lo que visto al inicio puede parecer mucho menos rentable, sin embargo, además de los beneficios ya mencionados, cabe destacar que en realidad alquilar una de esas casas suele salir económicamente hablando, mucho mejor a un mediano-largo plazo, ya que al encontrarse en una casa aunque no se dispone del beneficio de desayuno a la habitación, pueden hacerse compras en el mercado y preparar una buena comida casera, que en definitiva, sale mucho más económico. Al decidir alquilar una de estas casas para un viaje a Orlando, FL, es importante buscar con mucha antelación cual alquilar y por cuanto tiempo, ya que suelen ser muy cotizadas, al punto que las mismas pueden no estar disponibles para alquilarlas en un año entero. Las casas vacacionales en Orlando son sin duda una excelente opción a tomar en cuenta ya que para un viaje largo, entretenido, y agotador, no hay nada mejor que al dormir, la familia pueda sentirse como en casa.